We all know that choosing a diamond engagement ring takes quite a bit of time and consideration. We also know there are four C’s everyone says to consider when selecting the perfect diamond; cut, color, clarity and carats. But we think there a few other C’s that should be considered as you select a ring that is connected to the love story the two of you share. All kinds of information is available when selecting the best diamond and you will find that information below. Let’s start with the things we think you should also consider when selecting the perfect engagement ring for the love of your life, your one true soulmate. These 4 C’s represent the authentic relationship between the two of you. Diamonds are an ideal symbol of love and Commitment. A diamond reflects your commitment to each other, one that is resilient, strong and enduring. The engagement ring is Connected to your love story. It represents your love story, one that is authentic and rare, just as your engagement ring should be. The engagement ring will be a daily Companion that will never get old or dull, just as the companionship the two of you share. It will be a timeless piece of jewelry, with the hope and promise of becoming a family heirloom. Emmett considers the cut the most important quality to consider when selecting a diamond. A well-cut diamond will have both mirror-like facets and brilliance created by a “white-light” seen internally and externally. A diamond that is cut too deep or too shallow tends to have a lackluster appearance, which will reduce its value and brilliance. When it comes to the color of a diamond, less is more. The less color in a diamond, the higher the grade. The GIA scale ranges from d, colorless to Z light yellow or brown diamonds. Colorless diamonds are very rare and seldom used in jewelry.. Emmett prefers f or g graded diamonds. Similar to color, the clarity of a diamond is also measured on a scale. The Clarity Scale has 6 categories, some of which are subdivided making for a total of 11 grades. The clarity is always graded under a 10x magnification. The flawless (FL) diamond has no inclusions or blemishes visible under 10X magnification, while the Internally Flawless (IF) has no inclusions under the same magnification. Inclusions occur when the diamond forms in the earth's mantle, as it was crystallized under heat and pressure, so while there are treatments that boast creating a clearer stone, a “flawless" diamond is extremely rare. Diamonds that are graded Very, Very Slightly Included (VVSI) to Very Slightly Included (VSI) have inclusions that are observed by a trained eye and sometimes even those inclusions are difficult to see. Emmett recommends that clients choose a diamond that is Slightly Included (SI1-SI2). The inclusions in this grade of diamond will have noticeable inclusions under a magnification lens. The Included (I) graded diamond will have obvious inclusions under 10x magnification, but the transparency and brilliance will also be affected. of 10x. Diamonds that are graded in the SI1 and SI2 range are slightly included but their imperfections are often invisible to the naked eye. Carats refer to the weight of the diamond. As the carat size increases so does the rarity and the cost of the diamond. The higher the Carat weight does not mean that it will be bigger,nor better. But a diamond that has a bigger carat weight doesn't necessarily mean it will look bigger. The appearance of size all depends on not only the shape of the diamond, but the different designs and mountings you choose. 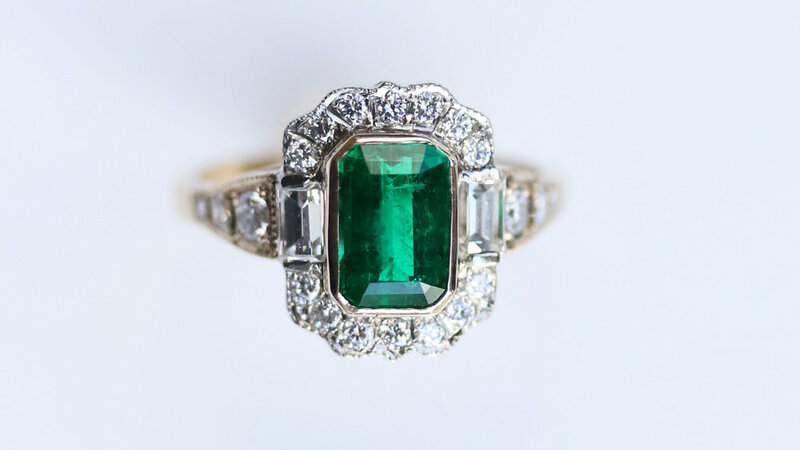 The bezel setting was the earliest method of setting gemstones into jewelry. 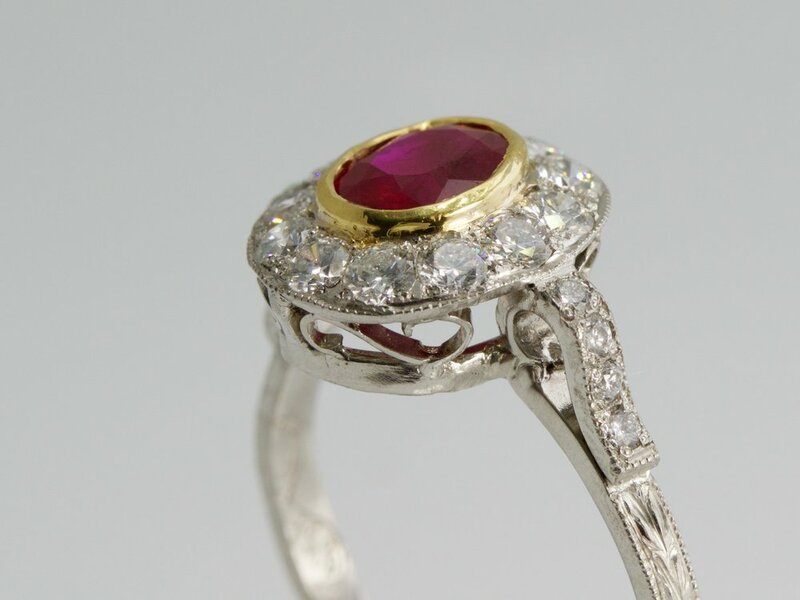 In historic examples, jewelry was often made by leaving a hole or slot in the ring with a thin lip, which was bent over the stone once it was in place. 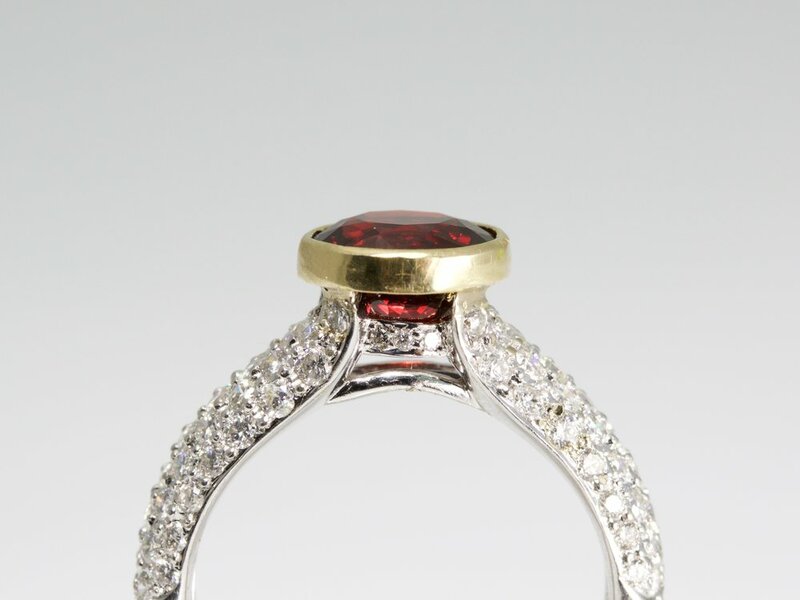 In modern times, a sleek metal rim surrounds the perimeter of the center stone, and holds it in place. Bezel settings use a type of elevated collar, which wraps the rim of the diamond or gemstone in a complete precious medal band. In making a typical modern bezel setting the bezel is shaped into the size and shape of the gem or diamond and then soldered onto the band with the laser-welding machine. . 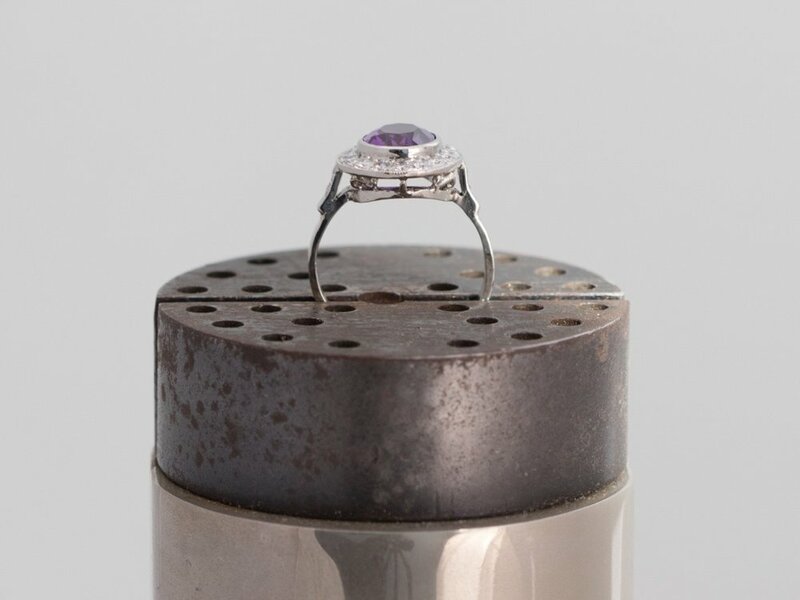 This type of setting is the most secure for any gemstone or diamond. There are many variations available with a bezel setting. The first of many choices is deciding on the precious metal to be used for the setting. Emmett offers 14kt or 18kt yellow, rose or white gold as well as platinum. Once the medal for the setting is chosen, the medal for the bezel collar is made. Although there is no right or wrong choice when choosing the metal for the collar, there are certain gemstones that contrast better with certain precious metals. For example, a blue sapphire looks much deeper in color when set in platinum. 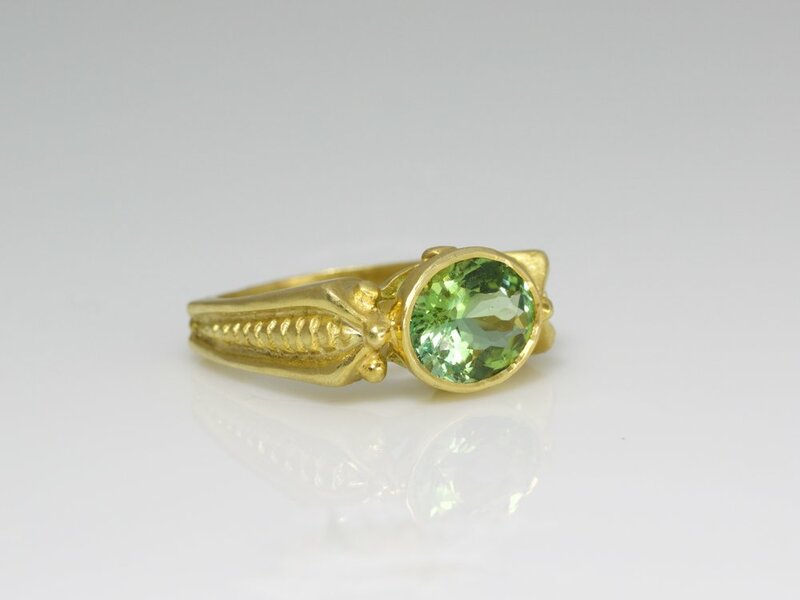 Pictured below is a Green Tourmaline set in an 18kt yellow gold bezel on a platinum band. Mixed metal bezel featuring an 18kt gold collar with a platinum band. This setting is making a comeback and the possibilities are endless. It is especially popular with individuals that have an active lifestyle. The setting is ideal for protecting softer gemstones and its smooth surface won't snag on clothing. Clients often ask me what they should do with old jewelry that they no longer wear. They aren't sure if it is worth anything and yet they can't bear to discard it or leave it sit in a drawer any longer. This jewelry is perfect for creating the jewelry you always dreamt of having. The first step in creating custom jewelry begins with the client’s vision of the final product. During a consultation, Emmett will discuss with the client their favorite styles and how their jewelry can be incorporated into a design that will showcase their diamonds and gemstones in a setting that is custom designed for them. The client brought in jewelry that they no longer wear and had been keeping in their jewelry box. After the initial consultation, Emmett will evaluate the diamonds and precious stones; verifying shapes, sizes and quality. He will then create the design on the Using the information gathered thus far, Emmett then creates a computer rendering of the design and sends the file to the client. After the client reviews the new creation, Emmett will discuss any request for changes and make them accordingly. A computer rendering of the design is provided to the client for approval. Once the changes of the rendering have been made and review, Emmett begins the milling process of the wax model. This process will provide the client with a physical model of the design. This enables the client to actively engage in the design process, ensuring that their vision of the product is the one they desire. It is during this step of the process that the client grants Emmett final approval. With the client’s approval, it is time to start the final process of building the ring. This process begins by casting the model and preparing the metal for the intricate work of setting the diamonds and precious gemstones. The final craftsmanship process is accomplished in approximately four days and the client is called to let them know their piece is ready. The last step to the custom jewelry process is the one filled with the most anticipation. As Emmett watches the client anxiously see their dream become a reality, he is hopeful that the reaction will confirm that he has fulfilled the client's expectations. The client’s satisfaction is most important aspect to Emmett and is the beginning of the continued relationship that he builds with his clientele. Emmett personalizes each piece of jewelry with a custom Emmett Blevins Jewelry logo; committing to the client that he stands by the quality and craftsmanship of the piece.